08-Oct-2004 -- On a trip from my home in Virginia to Atlanta, I planned a route to visit a number of geodashing dashpoints and this confluence. 35N 80W is a few miles north of US-74 near Lilesville, North Carolina. 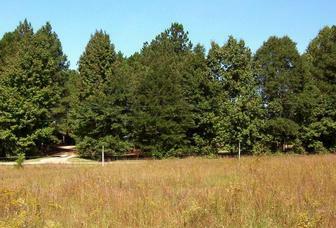 The confluence lies about 65 yards north of NC-1711 in a small pasture where horses are obviously kept. A newish white barn is not too far away in the background. After doing my GPS dance to get all zeros (photo #6) I looked up and saw three very nice looking horses some distance away (photo #5). I took my usual pictures to the north, east, west, and south (photos 1-4) and then returned to my car to continue my trek towards Atlanta. #1: The view north back to the road. #2: The view to the east. #3: The view to the west. #4: The view to the south. #5: Three horses some distance away.